For most people, knowing what you need to take care of the lawn depends a great deal on just how in depth you want to go when taking care of that lawn. If you are looking to simply trim the grass to a degree where it is not taking on the look of a rain forest, there are certain things you will need. If you are attempting to make your lawn look like the cover of Home and Garden, then you are going to need quite a few more garden tools and tricks. If you are going for something in between brilliantly manicured and left completely alone, then there are some basic tools and tricks of the trade you will want to keep in mind. Luckily for you, we've just decided to detail out some of the must haves for a wide variety of lawns and you can decide where to draw the line. When talking about trimming up your lawn, the mower is going to do the lion's share of the work. When it comes to doing the more delicate edging and trimming you're going to want to go with a more delicate tool. A grass and shrub shear is something designed to cut bushes or grass and can also be used as an edger in order to trim up the edges of the lawn of keep them looking good. This kind of a trimmer works best if your grass butts up against flowers or trees or something you don't want to run your mower over. In simple terms, the grass and shrub shear allows you to do more delicate trimming on your lawn. If you are just looking to keep your grass length at an acceptable level then there are just a few items you are really going to "need." Having some sort of a lawn mower seems like a no-brainer. The fact of the matter is that once you've decided on a lawn mower, that doesn't mean that your job is basically done. Arriving at the need of a lawn mower still leaves the decision of whether or not you are going to get a gas powered mower, or one that plugs in. There is also the question of whether or not you want to have a mulching lawn mower, or a bagged mower. 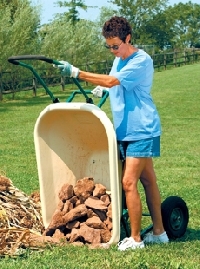 Mulching mowers clip the grass and then spread the clippings around on your yard. This can actually be beneficial because its like using instantaneous composting. This kind of composting can be quite good for your lawn assuming the grass wasn't so long that the clippings are weighing the cut grass down. The flip side is that you might want to have a clean looking lawn, with no clippings scattered about. Using a bagged mower isn't going to hurt your lawn, but you will need to take a few extra steps to make sure the clipped grass is getting food and water and is encouraged to grow. While you can certainly leave the health of your lawn up to nature, you can also choose to go with some fertilizer and grass food in order keep everything healthy and green. If your lawn gets plenty of sunlight naturally, then you are probably safe just making sure it gets plenty of water and it will grow naturally. If you want to take the extra steps to make sure the grass stays green you can go with fertilizers. Natural fertilizers like composting will work, but if you're trying to bring a lawn back from the dead, you might want to go with something a little more industrial strength. There are also brands of fertilizer that are specially formulated to help winterize your grass should you live in a climate that sees your yard buried under ice and snow for a few months out of the year.